The Sun has a pretty important job. That big yellow star spends every day making sure the whole Earth is warm enough to live and it also makes sure that it’s nice and bright outside, so we can see. On a more nerdy note, it also has to make sure it puts out enough gravity to keep all those rascally planets orbiting around it. We’re pretty sure that even the moon is totally jealous of the Sun. Your little one also has a pretty important job. Your child needs to brighten up your day and some happiness into each and every one of your mornings, so he's quite a bit like the sun. Maybe that’s why this child Sun costume is going to look great on your child. 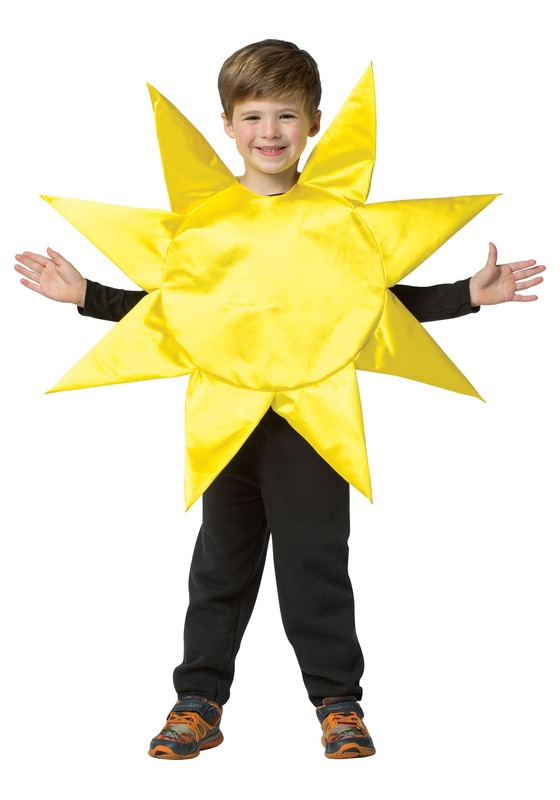 This Sun costume is a great kid’s outfit based on our solar system’s star. The costume is a bright yellow top shaped into a circle. It has the pointed sides to look like the Sun’s rays and it’s a look that’s sure to brighten up any day. You can use the outfit as a means to teach your little one about the solar system, or you can just send your kid off into the back yard to spread his good vibes around the neighborhood. You can also use it for any class play that requires the backdrop of a nice sunny day, where becomes the instant star of the play with this colorful costume. Also, we’re pretty sure that the Moon is also pretty jealous of your child, but we totally can’t prove it.